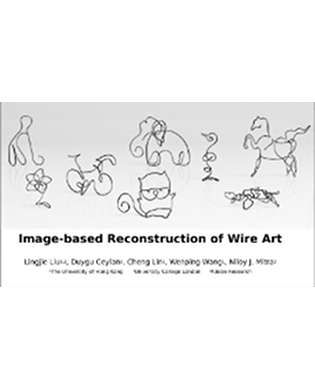 We present an image-based method to reconstruct wire objects from a few input images (3 views in our experiments). Our reconstructions faithfully capture both the 3D geometry and the topology of the wires. Objects created by connecting and bending wires are common in furniture design, metal sculpting, wire jewelry, etc. Reconstructing such objects with traditional depth and image based methods is extremely difficult due to their unique characteristics such as lack of features, thin elements, and severe self-occlusions. We present a novel image-based method that reconstructs a set of continuous 3D wires used to create such an object, where each wire is composed of an ordered set of 3D curve segments. Our method exploits two main observations: simplicity - wire objects are often created using only a small number of wires, and smoothness - each wire is primarily smoothly bent with sharp features appearing only at joints or isolated points. 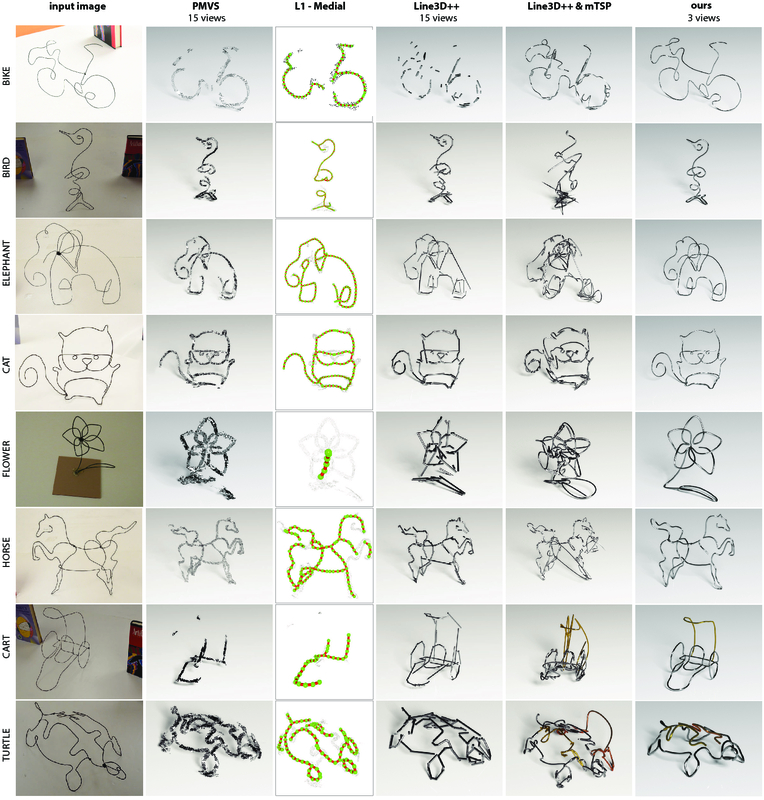 In light of these observations, we tackle the challenging image correspondence problem across featureless wires by first generating multiple candidate 3D curve segments and then solving a global selection problem that balances between image and smoothness cues to identify the correct 3D curves. Next, we recover a decomposition of such curves into a set of distinct and continuous wires by formulating a multiple traveling salesman problem, which finds smooth paths, i.e., wires, connecting the curves. We demonstrate our method on a wide set of real examples with varying complexity and present high-fidelity results using only 3 images for each object. Algorithm overview. Given a set of input images of a wire object, our method first detects 2D curve segments in each image. We then generate a set of candidate 3D curve segments corresponding to each 2D image curve and solve a global selection problem to choose one 3D curve from each candidate set. Finally, we recover the global topology of the 3D curve segments (as denoted by the dashed red arrows) and decompose the object into a set of continuous wires. We show this final reconstruction both in 3D and also how its projection (in red) aligns with the original image curves (in black). We evaluate our method on several objects of varying complexity. For each object, we provide one of the input images and our final 3D reconstruction. We also provide comparisons with PMVS (Furukawa and Ponce 2010) and Line3D++ (Hofer et al. 2016) run on a set of input images consisting of 15 views. Finally, we evaluate the L1-medial skeleton extraction method of Huang et al. (2013) on the point clouds generated by PMVS. We also run the mTSP formulation on the output of Line3D++ output to demonstrate how small variations can lead to large topological errors with significant errors in the final output.